Finding Rachel’s Final Resting Place . 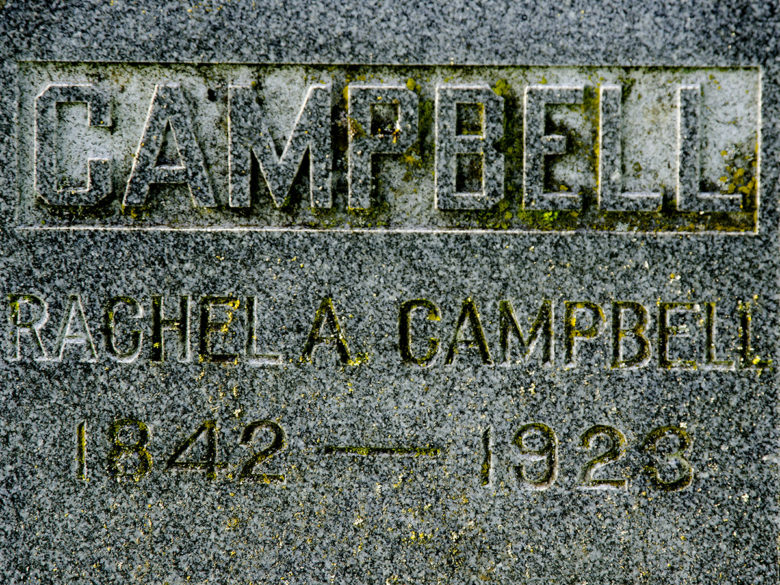 . .
No mention of mom or grandma, husband or child, the information on Rachel Campbell’s solitary grave marker read only her name and date of birth and death 1842 – 1923 . . . no other appellation. There were other grave stones 20 feet away . . . but none with the same surname. No family plot. Rachel appeared to be all alone. Judging by the years she was alive, Rachel might have remembered the Civil War, the Spanish-American War, World War I and the great flu epidemic of 1918. Perhaps as a child she was one of the multitudes that came along the Oregon Trail during the great migration. What was Rachel’s story? What I found was a total surprise. I was in Estacada looking for evidence of a friend’s extended family. Rachel wasn’t part of the search. Rachel belonged to me. She was my maternal great-great-grandmother. Though I knew most of Rachel’s story, I didn’t know it ended here. Rachel Amelia Root met Jacob Campbell, perhaps in Minnesota, maybe in Wisconsin; they married and had three daughters and a son: Louville, was born in Minnesota; Amelia, in Iowa; Gertrude and Walter, were born in Nebraska. The extended family migrated to St. Helens, Oregon. Jacob developed dementia and was hospitalized, died, and was buried in the Jason Lee Cemetery (near the mental hospital) in Salem, Oregon. His solitary stone doesn’t mention Rachel. Rachel was not alone in her last years of life and I was pleased that she was not alone in the cemetery. One of those gravestones 20 feet from Rachel belongs to daughter Gertrude who married Phillip Stamp. Rachel died while living with her daughter.